You are viewing the archived health insurance ratings. Follow the link to view the current health insurance ratings. There is nothing more important than your health. Compare major healthcare funds with our customer satisfaction ratings. * Overall satisfaction is an individual rating and not a combined total of all ratings. Brands with equal overall satisfaction ratings are listed in alphabetical order. Canstar Blue research finalised in February 2016, published in March 2016. Southern Cross Healthcare achieved a five-star review from Kiwis for overall satisfaction. Health insurance can be a bit of a grudge purchase – something we pay for but hope we don’t have to use. Despite this, the Health Funds Association of New Zealand (HFANZ) says that over a million Kiwis hold a health insurance policy, with health funds paying more than a billion dollars in the last recorded year. If you’re considering a private health fund, your first thought is probably to ask what advantages it has over New Zealand’s publicly-funded healthcare system. While the public system provides quality emergency services, patients who require important ‘non-urgent’ treatment may have to wait months or even years for an operation. On the other hand, private health insurance gives policyholders the confidence that they can receive the medical attention they need, when they need it. If you’re lucky, you won’t have any need to claim. In fact, our research found that 90% of New Zealanders enjoy just having the peace of mind that their insurance brings. In addition, 63% said they will sacrifice spending in other areas before they relinquish their health care policy. While you might consider yourself perfectly healthy now, life comes with its unrespectable twists and turns. If you became sick or injured, could you really afford to be without insurance? Health insurance is a safety net when you need it most, but which health funds can you rely on to make the claims process as stress free as possible? 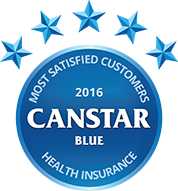 Canstar Blue has surveyed health fund holders across New Zealand to see how they rate their providers after making a claim in the last 12 months, and only Southern Cross Healthcare achieved a five-star review from Kiwis for overall satisfaction. Canstar Blue surveyed over 1,000 New Zealanders with a health insurance policy, and while 24% have compared premiums online from different health funds in the last 12 months, only 3% have actually switched providers. Of those who haven’t switched, 56% said they’re happy with their provider and feel no need to go elsewhere, while others stick around for other reasons – such as long term benefits, pre-existing health conditions, or the perceived difficulty of switching funds. Kiwis who have made the switch say they’ve done it for a variety of reasons, most notably because there was a better offer or cheaper policy available with another provider. The fact is health insurance costs generally only go in one direction, so it’s always worth comparing your options on a regular basis to assess whether or not you could get a better deal elsewhere. Worryingly, 29% of policy holders told us they have reduced or changed their cover as premiums have risen and this is particularly the case for older Kiwis aged in their 60s (43%) and 70 plus (46%). Have the confidence to switch if you feel so inclined, and if you do, our satisfaction ratings offer a helpful guide to how other consumers feel about their health funds. Stay healthy! Southern Cross is New Zealand’s largest health insurance fund. Southern Cross says it’s a not-for-profit company so it can give customers better value and service, claiming it pays 90.2% of premiums back in insurance claims (for the year ended June 2015). Southern Cross offers a range of health plans that cater for a variety of circumstances. Prices for essential cover begin from $1 a day subject to conditions. UniMed says it’s a not-for-profit mutual society, leaving more money to pay out claims. The company’s website says it paid out 88 cents for every dollar of premiums received in a five-year period ending July 2013. UniMed offers a number of plans with additional options to tailor certain plans to you and your needs. Prices for basic covers begin at $4.43 per week subject to conditions. Sovereign breaks its health insurance policies into two broad categories: Private health cover and private health cover plus. The standard policy covers surgical and hospital expenses, amongst other things, while the health cover plus product also includes cover for specialist tests and treatment. Sovereign also provides a number of extras to tailor its policies to your needs. NIB says it’s the second largest health insurance provider in New Zealand. It offers a range of private hospital plans, covering surgical and hospital expenses, as well as EveryDay Health plans for day-to-day health expenses such as GP and dentist visits. Prices for NIB’s basic EveryDay Health plan begin at $4.95 per week subject to conditions. Canstar Blue commissioned Colmar Brunton to use the ConsumerLink panel to survey 5,000 New Zealand consumers across a range of categories to measure and track customer satisfaction. The outcomes reported are the results from customers within the survey group who currently have a health insurance policy (which they pay for) and have made a claim within the last 12 months – in this case, 1,005 New Zealanders.